These liners are generally used as an alternative to the concrete pumped linings we also offer and are mainly used for domestic properties with multi-fuel appliances (stoves) and class 1 gas appliances upto a diameter of 7". This type of flue liner is needed for solid fuel open fires which states the required minimum diameter of 8"/200mm. This diameter is suitable for most open fires, but is very difficult to install into a 9"/230mm x 9"/230mm brick chimney so a concrete pumped liner is then the only alternative. 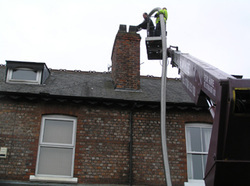 When a flue liner is installed, a steel register plate is used to seal the base of the chimney/inglenook (stainless steel gather hood for an open fire). All installations are to the manufacturers specification. As we are Hetas registered installers under our partner company name of Stove Installers, the appliance can then be connected to the liner and tested meaning it can all be done by one company. Even the supply of the appliance could be done through us!